One of the more surprising findings of the study, undertaken by the custom analytics team at Elsevier, was the mobility of the UK research base. "It's traditionally been called brain drain," says Dr Andrew Plume, Associate Director of Scientometrics & Market Analysis and an author of the study. "However, we have now come to view international researcher mobility as part of a productive cycle that's really win-win." While the number of researchers in the UK has been broadly stable for the last 15 years, the actual make-up of researchers in that pool is fluid. Only 37% of UK researchers never published with a non-UK affiliation over the period 1996-2010; the 63% that did comprise various subsets of internationally mobile researchers. "These individuals represent new talent that is coming to the UK, and researchers that are taking skills gained in the UK and seeding excellence in research elsewhere," adds Plume. Almost 63% of researchers who were affiliated with UK institutions between 1996-2010, have also published articles while working at institutions outside the UK in the same period. Source: Scopus. "The UK university sector is a desirable place to work," says Xavier Lambin, Professor of Zoology at the University of Aberdeen. He left Belgium 25 years ago and worked in Norway and Canada before settling in the UK. "What strikes me about Aberdeen is that it is extremely international — about a third of our staff do not come from the UK. In general, the UK is known to be international, and so people are attracted here without fear of discrimination, or worries about needing to be part of some particular research group, which is more of a concern in mainland Europe. That perception of openness is important." ... the UK's success on an increasingly competitive global scene depends on our very openness. Of the population of academics who were research-active and associated with the UK at some stage between 1996 and 2010, almost two thirds were also affiliated to a non-UK institution. We are remarkably well-connected. Nearly half of all publications from UK research between 2006 and 2010 had a non-UK co-author. The same data throw up another positive trend – that, judging by changing institutional affiliations in publications, the UK attracts and retains talent from other countries." David Willetts, Minister of State for Universities and Science during his Gareth Roberts Lecture, 19 October 2011. Collaboration also featured strongly in the report. "It's a very healthy sign," says Plume. "Studies have shown that multinationally-authored articles are more highly cited than those that are not, and this is over and above a multi-authorship effect (that leads to additional self-citations). It's also a way for smaller, specialized research groups in the UK to team up with other groups worldwide and have a bigger international impact." 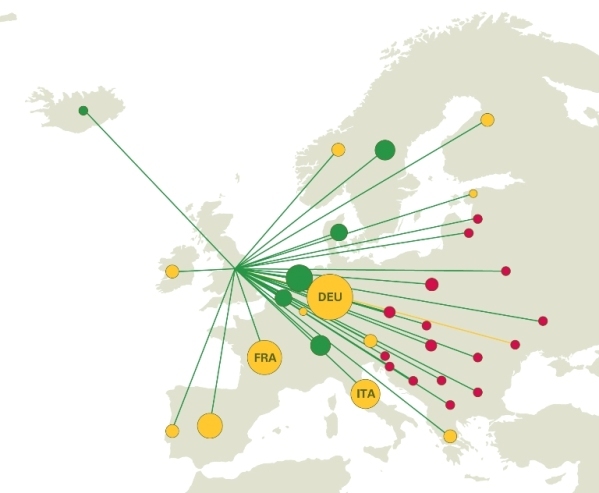 Like facilitating mobility for researchers, fostering international collaboration and mobility could be a way to maximize the impact of the UK's already highly productive research base. The proportion of UK articles co-authored with non-UK researchers is high and rising, and reached 46% in 2010. This proportion is far higher than in most other research-intensive nations and also contributes to the UK's high number of citations per researcher, because articles that have co-authors residing in more than one country tend to be more highly cited than those that do not. 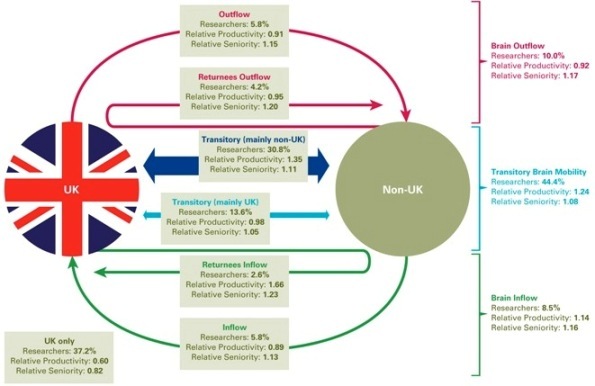 The ability of UK-based researchers to move internationally and to collaborate with non-UK researchers is therefore a key driver of the UK's leading global position in terms of research efficiency. While the UK collaborates with a variety of countries, these collaborations tend to result in research that is better-cited even than the UK's own (already high) average, regardless of collaborating country and accounting for differences in field-specific citation rates. Source: Scopus. Figure 2 is an international collaboration map for the UK in the period 2006-2010. (A) World (excl Europe); (B) Europe only. 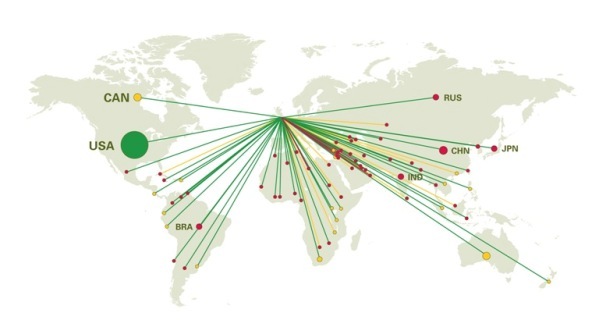 Mapped countries include only those with at least 1,000 publications in this period (i.e. 109 countries, representing 99.8% of the UK's internationally co-authored articles). Bubble sizes (within each map only) represent the relative volume of collaboration between the two countries; Bubble colour represents the Field-Weighted Citation Impact (FWCI) of each country for all its papers: Green = FWCI greater than UK; Yellow = FWCI less than UK but greater than world average; Red = FWCI less than UK and less than world average. Line colour represents the Field-Weighted Citation Impact of collaborative papers relative to all papers where: Green = FWCI greater than UK average for all papers; Yellow = FWCI less than UK average but greater than world average; Red = FWCI less than UK and less than world. Source: Scopus (map generated using Gephi 0.8 alpha with Miller cylindrical projection layout and coordinates from the CIA World Factbook. The exported network was placed over a blank world map image). "The LBAS (Language-Based Area Studies) centres have been very successful," says Marilyn Martin-Jones, Emeritus Professor at the University of Birmingham. "They have not only done research and language training but have also reached out to chambers of commerce, local industry, and other national bodies, as well as teaching diplomats about the countries in which they work." The UK clearly has a long history as a research-focused nation, an advantage that most nations can't replicate. 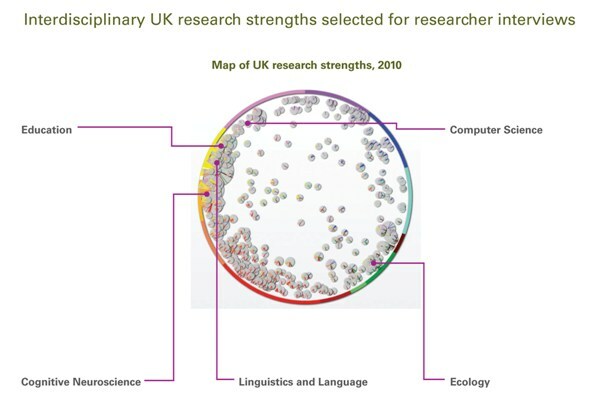 That said, its systematic approach to assessing research strengths may help the UK to retain that advantage. As mother would say, do your homework. Now go play outside, it's a beautiful day. 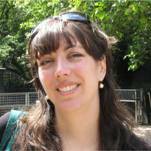 Noelle Gracy received her PhD in Neuroscience from Cornell University, Graduate School of Medical Sciences, New York, and completed her postdoctoral training at The Scripps Research Institute in California. An Executive Publisher until 2009, she now works as Director of Community Engagement with Elsevier's many advisory boards and was part of the Elsevier team producing the UK Department of Business, Innovation and Skills report International Comparative Performance of the UK Research Base - 2011.